For date nights, Ed and I often go to restaurants where we can peacefully talk about sweet nothings. But on a few occasions, we are keen on trying out lounge bars where we can chill, dine, listen to good music and have a drink or two. So, a few days ago, Ed and I found ourselves in Dubai's newest Spanish nightspot - Espana Lounge Bar. And it wowed us in all possible ways! 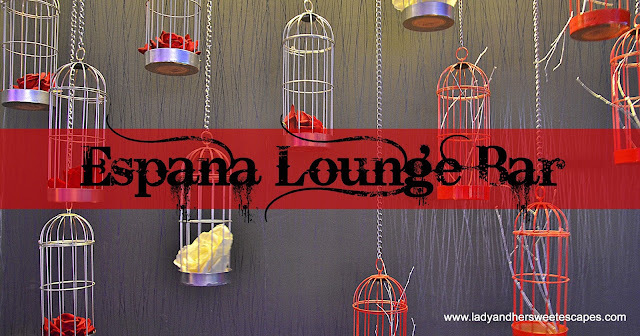 Espana Lounge Bar is a licensed restaurant and lounge located in the 5-star Jumeirah Creekside Hotel in Deira. We were welcomed to a peculiar yet fantastic atmosphere; a surreal wonderland that immediately tucked us away from the hustle and bustle of Dubai. The venue is decked in eclectic Spanish decor and stylishly divided into five areas. There is a Women's Only Bar; a private glass room illuminated with pink lights. Next to it are the Sangria Bar and Gaudi Bar which are both enhanced with contemporary pieces. The main dining area is surrounded with high-definition LED screens and pumped up with cool music from the DJ. And there is the Granada Terrace for some quiet time when all those aforementioned become overwhelming. We kicked off our night with some drinks at the bar. Our knowledge on cocktails is below average honestly. We occasionally drink, and when we do, we often stick to the basics. But Espana's bartender won't let us leave the bar with a basic drink in hand. I get him. Why would we when he can offer a plethora of fancy cocktails that can perfectly go along with Spanish Tapas? A few conversations later, he whipped up a His and Her's cocktail based on our preferences. I had the Monica Lewinsky; a fruity and flirty drink made of Vodka Skyy, raspberry, vanilla, lemon and topped with pineapple foam! Ed had the El Comondante; a richly-flavored cocktail made of Gold rum Bacardi infused with dates, fino sherry Tio Pepe, liqueur Maraschino, aromatic bitters Angostura. Ed loved the vibe at the main dining hall; hence we chose it over the charming and quiet Granada Terrace. We sat in a corner, and little by little succumbed to the fun eclectic ambiance. Before we knew it, we were teleported to the vibrant nightlife of Barcelona! We started our dinner with Pollo Loco. It is not the recipe that we all know, it is something better! Espana's Pollo Loco is a contemporary version of the classic Spanish Tapa. It is made of shredded smoked chicken, tossed with mayonnaise, mushrooms, green onion, croutons, almonds and pea seedlings. It is packed with a rustic Spanish taste, but invigorated with delicious nutty flavor and texture. We also had Croquetas De Pavo. I love croquettes; hence this was an easy choice from Espana's Tapas Authenticas list. This simple and delicious tapa was beautifully served and tasted quite impressive. It is crispy and golden brown outside, yet smooth and buttery inside. From the Tapas Modernas, we had a taste of the Smoked Salmon with Pumpkin. It is a light and healthy dish of tender and flaky salmon, placed alongside baked pumpkin, cheese, black pesto, almond petals, leek flour and Brussels sprouts. From the main courses, I chose to have the Beef Short Ribs. It doesn't sound Spanish, but as it was recommended by our cheery server, I gave it a go! The ribs should have been served on a bed of risotto, but since we visited Espana before the grand launching some of the items on the menu were not available yet. So, it came with mashed potatoes. I must say that the chef cleverly regained the strength of the dish by replacing the missing ingredient with a suitable alternative. It is a dish for two people to share. The meat is slightly dry outside that we both thought it needs to have a sauce. However, underneath the surface is a tender and succulent meat that can live without a dressing! We shared a plate of Drunk Plum for dessert. It sounds, looks and tastes interesting! Slices of plum-infused-vodka were hidden under meringue fragments. It is a sweet and fragrant dessert with delightful chewy and melt-in-the-mouth textures. Espana Lounge Bar is a newly-opened dining venue, but the staff are already doing a commendable job. They are friendly and cheerful. They know the food and drinks menu by heart. They are attentive! Espana is an amazing spot for food, drinks and music. It is indeed a Spanish hotspot! Prices are reasonable for a 5-star venue; some of the tapas at 25 AED only, mains are at 65 AED onwards, specialty cocktails start at 45 AED. We were invited to dine at Espana Lounge Bar. Hi Anne! The pictures you shared are mouth watering. Really appreciate your endeavors for sharing the best of Espana Lounge Bar. The dizzying choices of scrumptious cuisine and carousing wines available at Dubai’s restaurants & bars are amazing. Dubai never ceases to amaze the world with its stupefying wonders. Dubai Miracle Garden is one such destination that offers a perfect escape for nature enthusiasts to unhook from the hustle of insipid daily errands & embrace the calmness & mesmerizing beauty of Mother Nature.